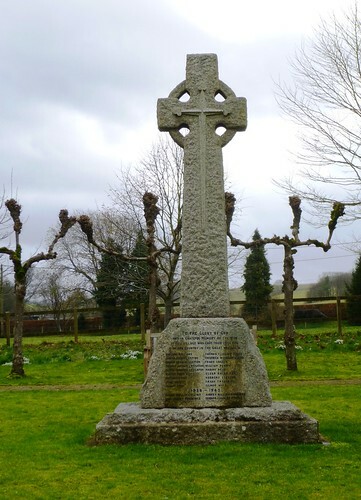 No wonder Cecil Beaton chose the Wiltshire village of Broad Chalke to make his home. Anyone with half an eye for setting and composition can appreciate the lure of a place like this – thatched houses, old stone and brick, a church amid it all, and the cradling downs rising on every side. 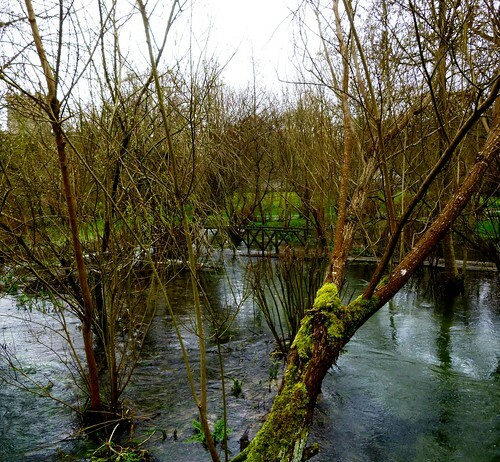 A handsome settled spot beside the River Ebble – and what a charming name that is for the bubbling and eddying chalk stream that rushes through the village. 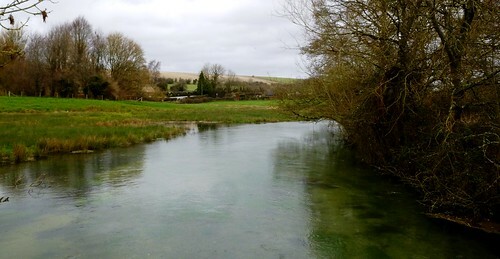 This grey afternoon a gale of wind tore the clouds over Broad Chalke. It hissed in the hedges and trembled the sere grasses along the flint trackway up Church Bottom. The wind-sculpted beech spinneys roared on the downland ridges high above. All colours were leached to subtle greens and greys. The air felt thick and cold on our faces. 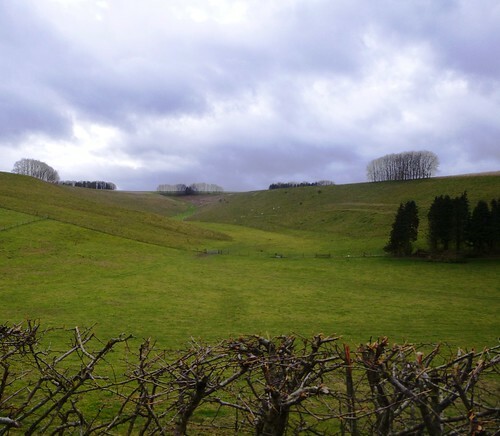 The aspect of the downs seemed instantly agreeable to the eye, the shapes of rounded shoulders, sloping sides and hollowed flanks recalling human rather than topographical form. The sun made a cameo appearance, slipping out through a rent in the speeding clouds to strike silver out of the chalky tractor ruts. 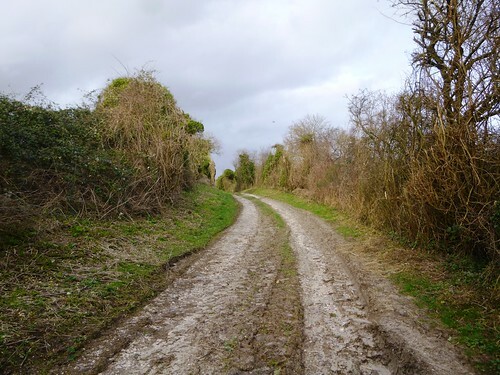 Up on the nape of the downs we met the Ox Drove, an ancient West Country trackway cut to ribbons by 4×4 drivers in recent times. 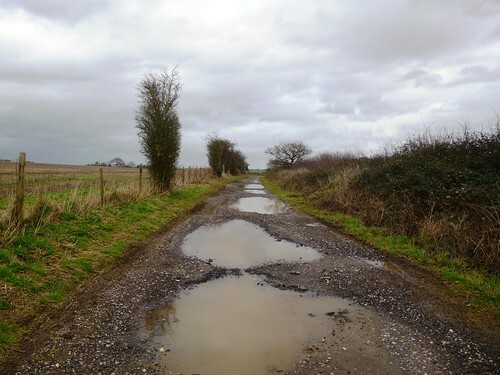 A notice headed ‘Voluntary Restraint’ invited the off-roaders to desist for the common good, but the two-foot-deep ruts and extravagant puddles bore witness to the effect they’d already had. 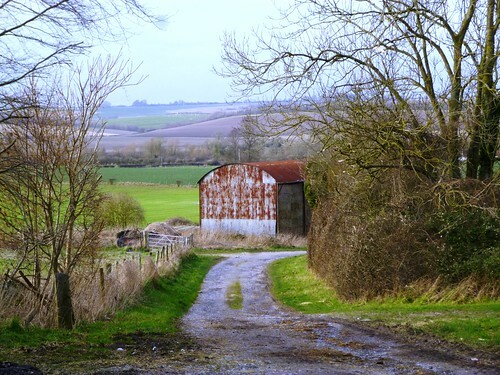 We dodged and plodged a mile of the old highway, and then plunged down the steep green lane of Croucheston Drove to where two huge and rusty old barns stood by the track in a sheltered dip out of the wind. 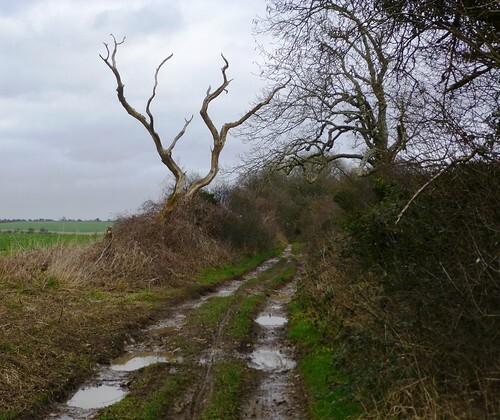 Up Bishopstone Hollow’s sunken lane under the pale grey powder-puffs of old man’s beard, and on with the gale in our faces once more by isolated Knighton Hill Farm among its singing shelter trees. 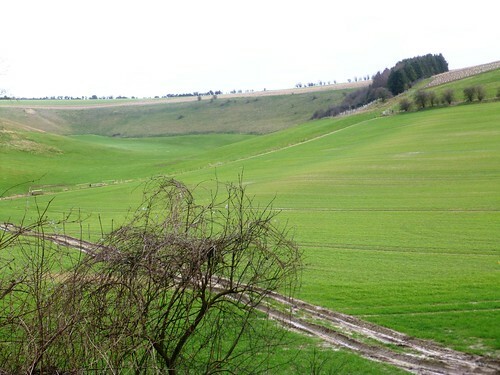 A tractor-marked path led away towards the valley of the Ebble, crossing vast flinty fields of young green wheat shoots. 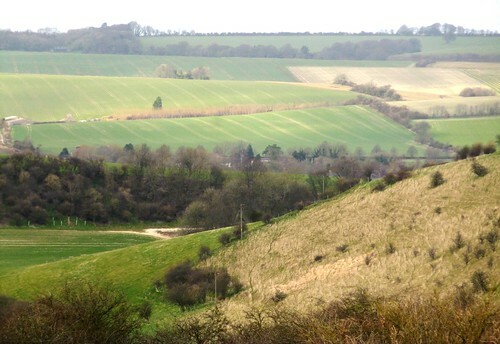 Over the brow of the hill and down a hollow hedge to where Broad Chalke lay snug below the race of wind and sky. 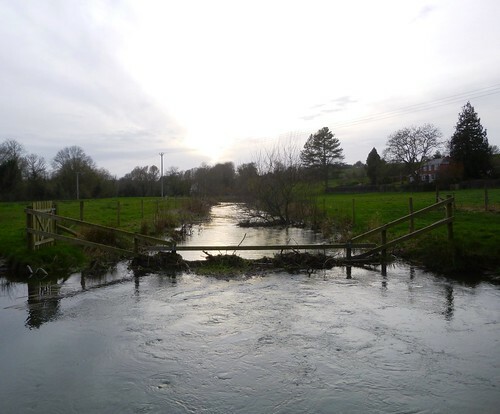 Road – Broad Chalke is signed off A30 at Fovant. Walk (6½ miles, easy/moderate, OS Explorer 130. 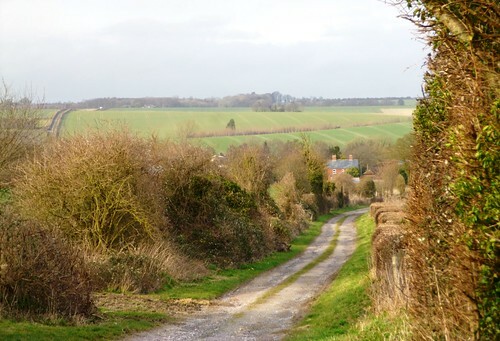 NB: online map, more walks at christophersomerville.co.uk): Follow ‘Bowerchalke’ road across Causeway Bridge, passing church. At right bend, keep ahead (‘Martin, Blandford’). At T-junction (042252) ahead up Church Bottom bridleway for 1½ miles to meet Ox Drove (052229). 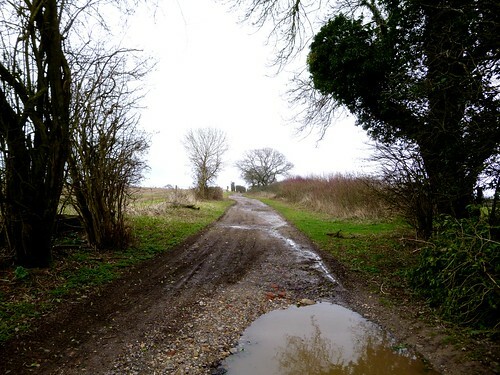 Left; in ½ mile, cross track to Knighton Hill Farm (059232) and continue (‘Byway’). 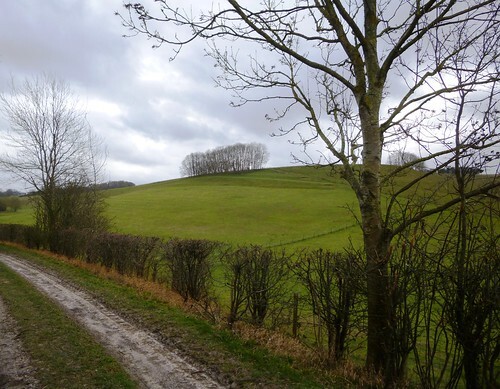 In ½ mile, left (067232, ‘bridleway’) down Croucheston Drove green lane. 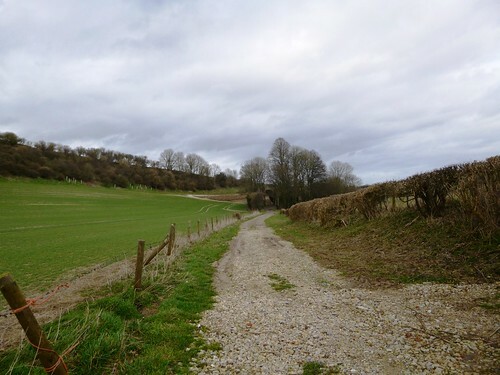 In 1 mile, by second of 2 barns, left (067247, yellow arrow/YA) up Bishopstone Hollow to Knighton Hill Farm. Follow YAs past farmhouse (057242); at brick shed, dogleg right/left round shed (055242, YAs) and on along grassy ride between tree hedges. In 200m, right (054241, YAs on left) through hedge; over stile ahead; cross track; ahead across field, following arrow posts. In 700m, fork left (052247); follow arrows to stile (048248); down old hedge/ditch to stile (043250); right down to lane (043251); right into Broad Chalke. 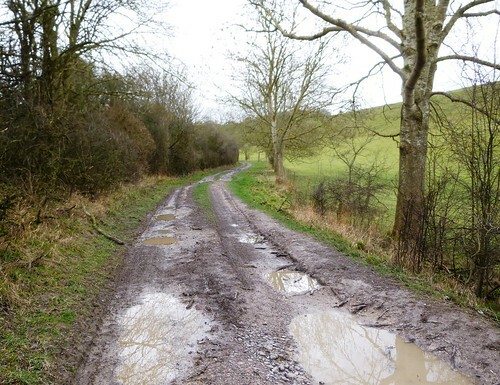 Conditions: Deep, muddy ruts on Ox Drove! Lunch/Accommodation: Queen’s Head, Broad Chalke (01722-780344; queensheadbroadchalke.co.uk) – cosy, friendly country pub.